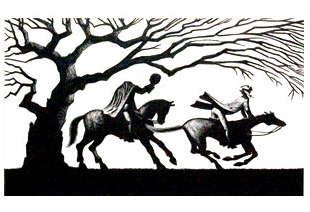 "The Legend Of Sleepy Hollow"
If you thought you knew all there was to know about Ichabod Crane and his midnight ride with the Headless Horseman, be forewarned imaginary beasts plans to turn Washington Irving’s classic tale inside out when they return to Boston with their annual Winter Panto. Performances will take place January 11 – February 2, 2013, at the Plaza Black Box Theatre at the Boston Center for the Arts, located at 539 Tremont Street in Boston's South End. Directed by Matthew Woods, the cast features Mikey DiLoreto, Derek Fraser, Molly Kimmerling, Amy Meyer, Christopher Nourse, Elizabeth Pearson, Jill Rogati, Kiki Samko, Michael Underhill, Matthew Woods and Joey C. Pelletier. A well-loved tradition in the United Kingdom, Pantos are seen much more rarely in the United States. But imaginary beasts is keeping the tradition alive in Boston -- this time giving it an American twist. Using the familiar American tale, The Legend of Sleepy Hollow as a springboard, the beasts’ ensemble collaborates to write their own script, where good always triumphs over evil and the spirit of wonder is very much alive. Far from the silent movement routines typically associated with traditional pantomime, the British winter tradition of Panto is a hybrid comic form that offers fun for the whole family. Current events and local references are crossed with theatrical magic and traditional Vaudeville routines, and at the center of the spectacle, the battle of good versus evil is played out. When the little town of Sleepy Hollow finds itself under an evil enchantment cast by a mysterious magician, it falls to young Ichabod to save the day. But can the hapless schoolmaster overcome his fears and superstitions enough to break the spell and win the girl of his dreams? Or will the Headless Horseman leave him --and the entire town -- in the dust? While audience members will never have to leave their seats, they will be encouraged to participate by cheering the Good Guys and booing the rest, for it is only with audience support that the good, right and true can triumph. All the while, popular culture and social mores are given a hilarious send up. For information and tickets, call 617-933-8600 or visit www.bostontheatrescene.com.